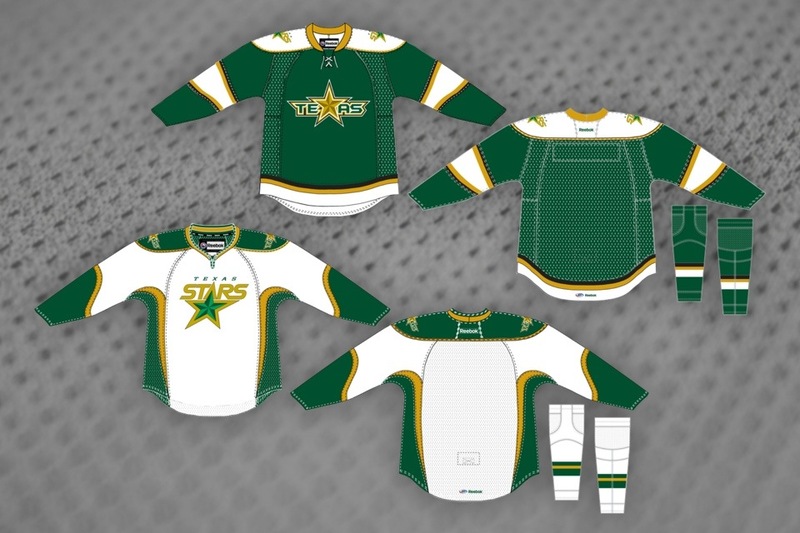 Our series of features looking at minor league theme jerseys picks up this week with the AHL's Texas Stars. 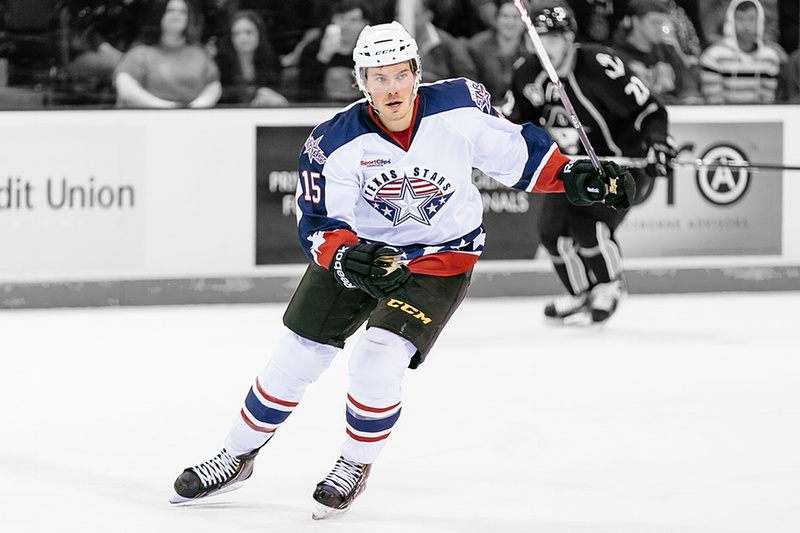 The Stars are celebrating their fifth anniversary in Cedar Park this season. The franchise was actually founded 15 years ago as the Louisville Panthers, but the team shut down after two seasons. They were resurrected in Des Moines as the Iowa Stars in 2005. The name was changed to Iowa Chops for the 2008-09 season when the club became affiliated with the Anaheim Ducks. 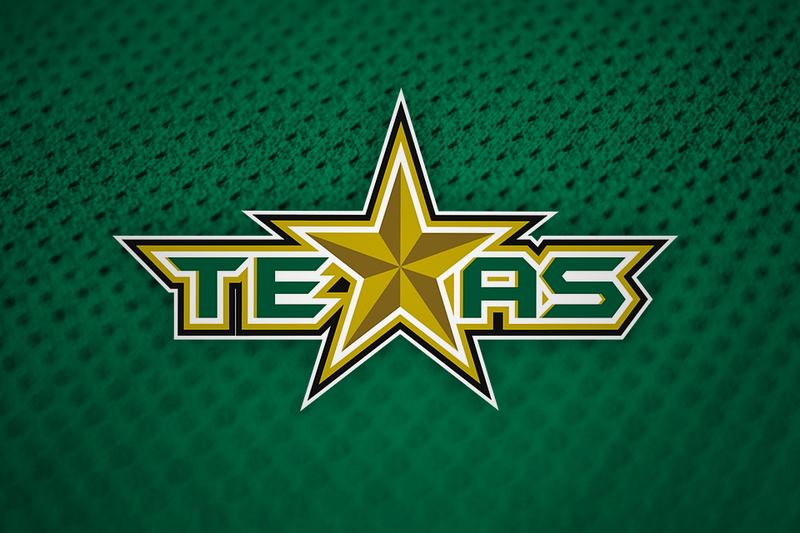 In 2009, the franchise was sold and moved to Texas a re-affiliated with Dallas. During the 2013-14 season, the Stars wore three special theme jerseys. Before we get to those, the mini-slideshow up top will give you an idea of what the team looks like on a regular basis. The Stars just unveiled this look last May. The Stars held the first of two military appreciation weekends leading into Veterans' Day. Players were decked out in this patriotic mix of red, white and blue for Stars & Stripes Weekend. Be sure to check out all the photos above. The special sweater was designed by Stars center Taylor Vause, who was featured here on Icethetics two years ago when he created a couple of jerseys for his WHL team, the Swift Current Broncos. Great to see Vause moving up through the ranks both in his jersey design career as well as his playing career. The Stars wore this sweater for two games against the Milwaukee Admirals. Both were high-scoring outings as Texas won 7-4 and 5-4 on back-to-back nights. The weekend was sponsored by Sport Clips and the subsequent jersey auction benefited the Texas Stars Foundation. Pink-infused jerseys hit the ice in Texas just last month as the Stars hosted their annual Pink in the Rink Weekend, sponsored by Cedar Park Regional Medical Center. 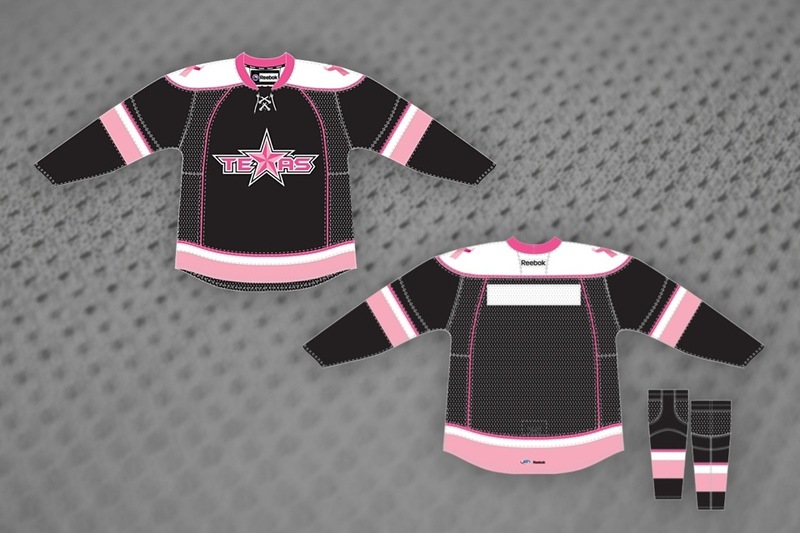 "Our Pink in the Rink sweater was my first stab at designing a jersey," said Texas Stars graphic designer Alisa Kessler. 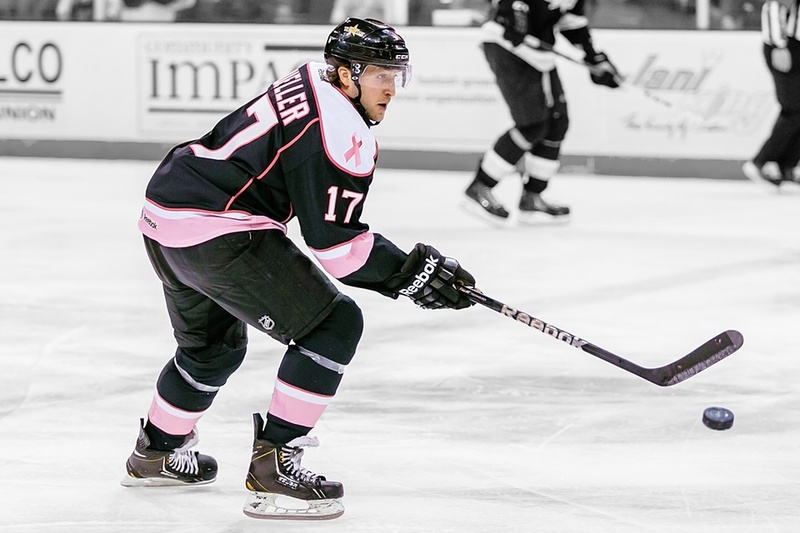 Her black-based cancer night jersey was among the best the AHL had to offer this season, if you ask me. For more, see this post from Feb. 5 and this one from Feb. 24. The theme jerseys continued to be hot for the Stars as they defeated the Charlotte Checkers on back-to-back nights, coming out on top 4-1 on Friday and taking a shootout win on Saturday. Jersey auction proceeds benefited Breast Cancer Resource Centers of Texas. 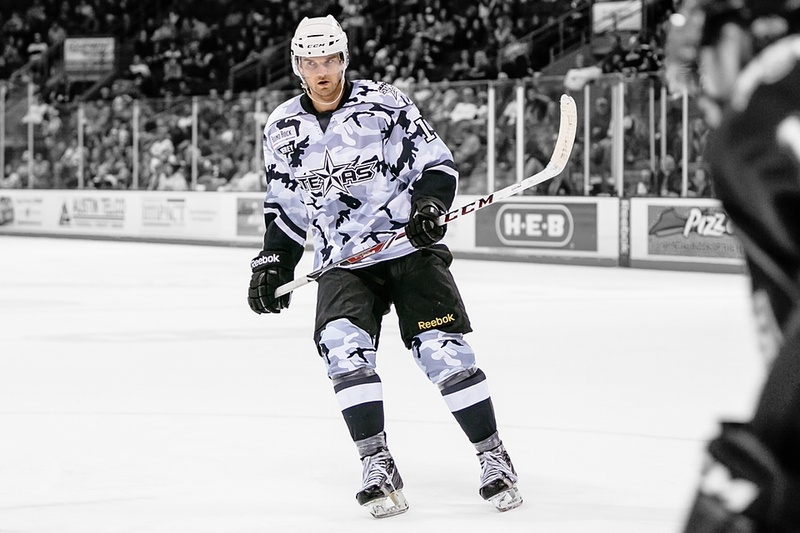 Finally, this past weekend, the Stars honored the military once more with these black and white arctic camouflage sweaters. I imagine it'd be easy for the opposing team to lose track of a puck shot at a goalie's chest. Where'd it go? 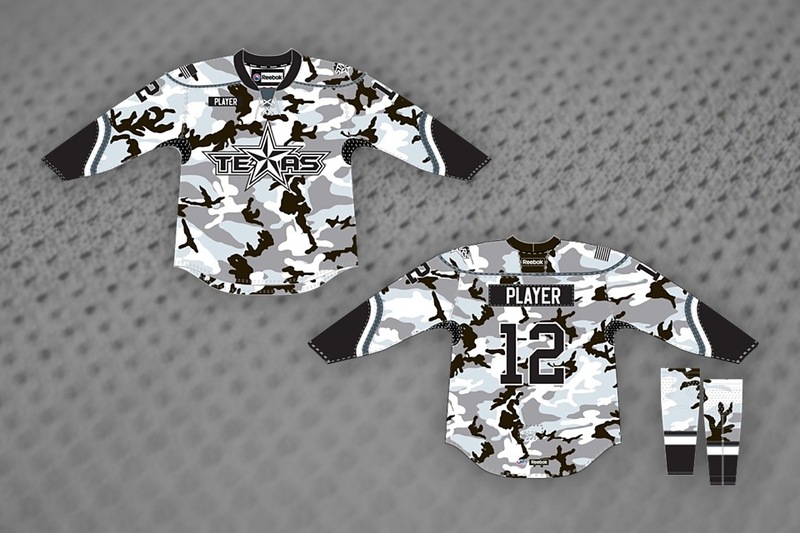 "I helped design our latest Military Appreciation arctic camo jersey as well," said Kessler. "But the general concept/look didn’t change too much from last year – mostly just the color was swapped out from woodland to arctic." Round Rock Auto Group sponsored the weekend and auction proceeds benefited the Texas Stars Foundation. 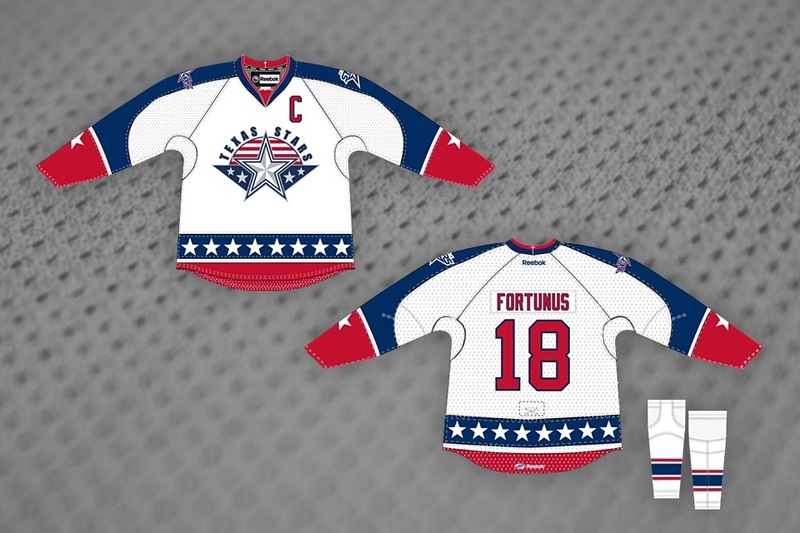 The Stars were successful again wearing special uniforms for back-to-back nights against the Oklahoma City Barons. Texas won 4-3 in a shootout on Friday and 5-3 on Saturday. In fact, the victories helped the Stars become the first team to clinch a spot in the 2014 Calder Cup Playoffs. 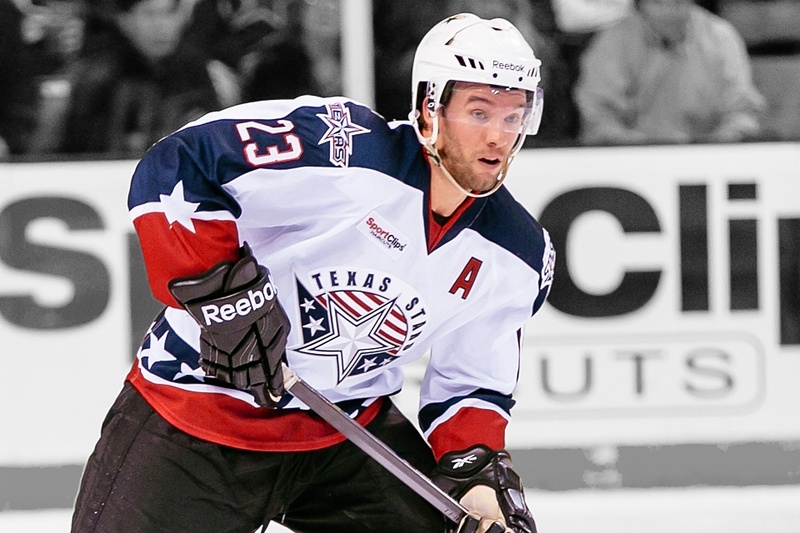 Which Texas Stars theme jersey was your favorite? In wrapping up, I have to extend a huge thanks to Texas Stars graphic designer Alisa Kessler, who was extremely helpful in putting this story together.